Pre-war uranium mines with hidden underground equipment and crews managed to survive the apocalypse and are still extracting valuable uranium. Over the following decades, many of the heavy mining machines were transformed into deadly weapons and sent to defend the underground fortresses. This way a new town was founded. 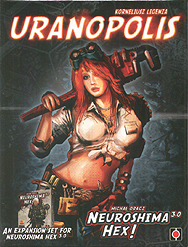 Uranopolis - a rich mining town, effectively guarding their treasure from being plundered by grabby neighbours.